mmmh, i dont know, im not an expert with this. This is an emergency fix for NanoAdblocker#257. The issue is that whenever an empty hostname was passed to getPublicSuffix.getDomain(), the next call to getPublicSuffix.getDomain() with a valid hostname would return an invalid result. I expect the erroneous behavior to be a rare occurrence, vast majority of calls to getPublicSuffix.getDomain() are with a valid hostname. Issue affected Firefox mostly as it was an issue with managing IndexedDB-based cache storage, which is default in Firefox. Thanks to @gwarser who spent an inordinate amount of time helping narrow the issue. i dont know if this tv-channel is receivable outside from germany... and who understands the german language. uBO is already using more than 5MB of storage in its basic configuration. In a future version, uBO may start to use a "persistent" indexedDB instance for its cache storage to ensure proper functioning of uBO. uBO currently uses a non-persistent indexedDB instance and this may cause difficult to diagnose issues for some users as Firefox may evict uBO's cache storage at any time. uBO's cache storage is used to store filter lists, their compiled counterparts, and snapshots of various internal data structures for fast launch time). i have checked a sample of scheduling like the documentation shows me (because i dont have the pro-version of ccleaner) and it works fine also in the "free-version"
yes, in the taskbar you can see the ccleaner-icon at the setted time that the scheduled task works. This release is for Chromium-based browsers only. 1 Choose File  Preferences  General Program Preferences. 2 From the left pane, choose Auto-Preserve. 3 Mark the Enable Auto-Preserve check box. 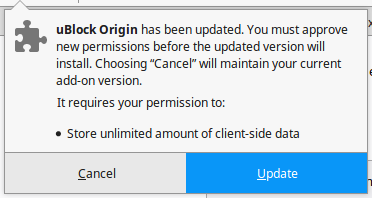 In the dialog box that appears after you click Save, choose Yes - Do this every time. The original (unedited) image is copied to a Corel Auto-Preserve subfolder, which is automatically created within the folder in which you are saving the image.